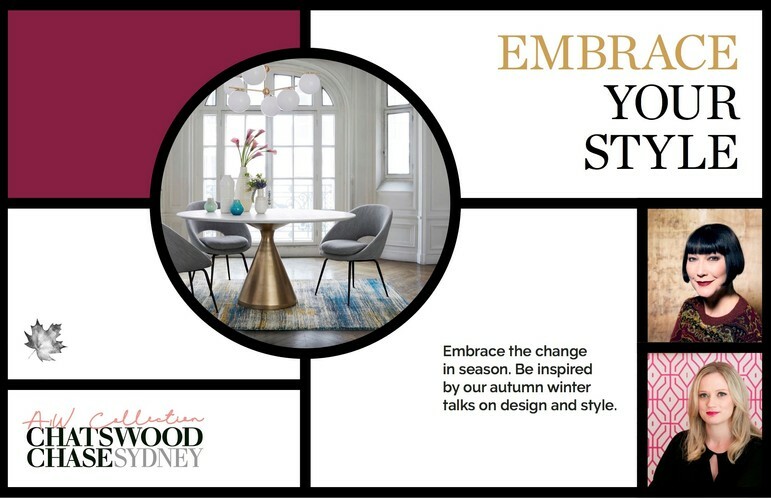 Chatswood Chase Sydney will host an inspiring series of interior design talks presented by fashion identity and TV presenter Claudia Chan Shaw, and renowned interior design blogger Jen Bishop. Bishop is the founder of Interiors Addict, one of Australia’s leading home and lifestyle websites; while Chan Shaw is the co-designer and director of Australian fashion label, Vivian Chan Shaw, and is well known for her role as co-host and presenter on ABC TV’s Collectors. Nurseries are a big part of getting ready for a baby’s arrival and one of the most fun rooms to decorate, yet they also need to be safe and practical. Bishop will delve into the essential must-haves for nurseries, how to decide on a theme or style, tips for creating a timeless space, and a look at nurseries throughout the ages. From the passé to the classic, Chan Shaw winds back the clock to examine the past 50 years of Australian interior design. In this trip down memory lane, revisit the space age 60s, the timber and rattan 70s, the maximalism of the 80s, the minimalism of the 90s, and the 2000s ‘anything goes’ mix of sophisticated elegance meets retro mid century. Many people struggle with how to make the key pieces they have bought come together in a cohesive, stylish way - seeking that magazine look but having no idea where to start! Bishop will explore the elements needed for a successful living room and how to make them sing. Chan Shaw examines the fascinating life and legacy of Florence Broadhurst, whose designs grace the walls of hip nightclubs, homewares, travel goods and fashion. Hiding her humble beginnings and passing herself off as a French couturier and an English aristocrat, Broadhurst’s life came to a terrible end when she was the victim of a brutal murder in 1977.